The Mannosylated Macrophage Depletion Kit contains m-Clodrosome® (liposomal clodronate) and m-Encapsome® (control liposomes). 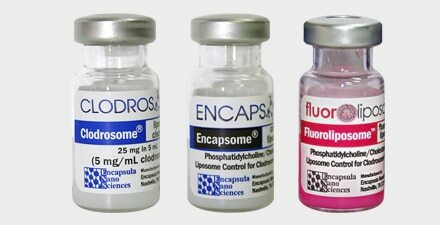 The Mannosylated Fluorescent Macrophage Depletion Kit contains mClodrosome® (liposomal clodronate) and m-Fluoroliposome®-DiI (fluorescent control liposomes). The Mannosylated Fluorescent Macrophage Depletion Kit contains m-Clodrosome® (liposomal clodronate) and m-Fluoroliposome®-DiO (fluorescent control liposomes). 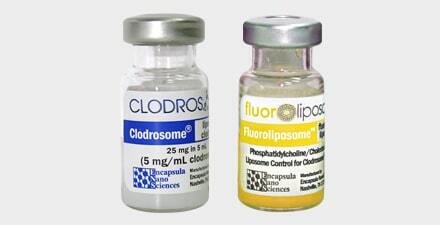 The Mannosylated Fluorescent Macrophage Depletion Kit contains m-Clodrosome® (liposomal clodronate) and m-Fluoroliposome®-DiD (fluorescent control liposomes). The Full Mannosylated Macrophage Depletion Kit with m-Fluoroliposome®-DiI contains m-Clodrosome® (liposomal clodronate), m-Encapsome® (control liposomes), and m-Fluoroliposome®-DiI (fluorescent control liposomes). The Full Mannosylated Macrophage Depletion Kit with m-Fluoroliposome®-DiO contains m-Clodrosome® (liposomal clodronate), m-Encapsome® (control liposomes), and m-Fluoroliposome®-DiO (fluorescent control liposomes). 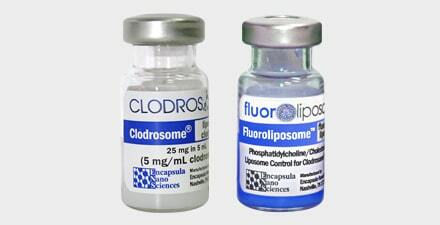 The Full Mannosylated Macrophage Depletion Kit with m-Fluoroliposome®-DiD contains m-Clodrosome® (liposomal clodronate), m-Encapsome® (control liposomes), and m- Fluoroliposome®-DiD (fluorescent control liposomes). 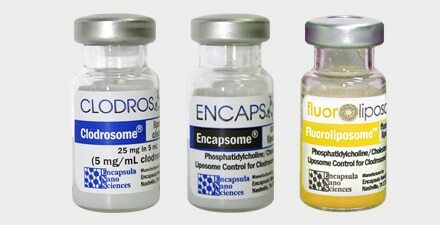 Clodrosome®, Encapsome®, and Fluoroliposome® are trademarks of Encapsula NanoSciences. The content of the website can only be used by researchers, educators and students for educational purposes. Any commercial use of the content of the website is legally prohibited by the laws of the United States of America. All the products sold on the website are for research purposes only. Any use of these products in humans or animals/ pets for treatment purposes is legally prohibited by U S Food and Drug Administration.